ADORED VINTAGE: Brand New Year! And Yes... I'll Finally Update this Blog! Brand New Year! And Yes... I'll Finally Update this Blog! I crafted these little "Thank You" cards to send out with AV orders. So if you place an order on AV anytime soon, you'll get one of these little lovelies. 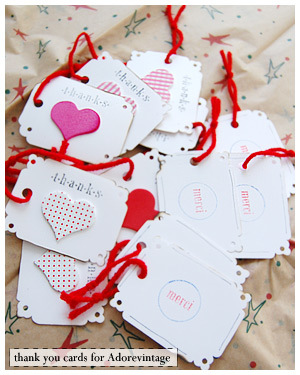 I have a lot of shipping to catch up on, which is terrific because I can add these little trinkets on to the packages. I am making a few other designs as well. Aren't these so cute?